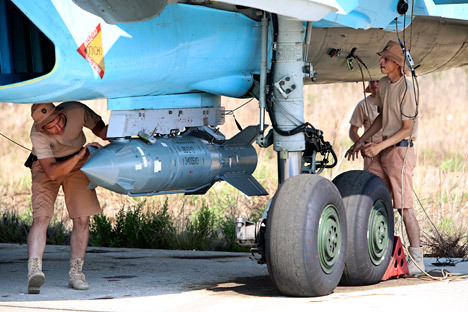 In this photo taken on Saturday, Oct. 3, 2015, Russian military support crew attach a satellite guided bomb to SU-34 jet fighter at Hmeimim airbase in Syria. While the Kremlin has denied a CNN report that Russia was preparing for a ground operation in Syria, Russian analysts assert that Moscow will not want deeper involvement in the conflict and is likely to limit itself to air strikes. The Kremlin dismissed suggestions in the western media that Russia was readying to land troops on the ground in Syria to prop up the beleaguered President Bashar al Assad. Denying the CNN report, the Russian President’s spokesman Dmitry Peskov told journalists that "CNN could have got it wrong. They even confuse Putin with Yeltsin." The report broadcast on CNN based its story on the transfer of Russian-made artillery systems from the Russian air base in the coastal city of Latakia further into Syria. Analysts in Russia have also dismissed the speculation in the western media about Moscow planning to launch ground operations in Syria. Soon after the air strikes were launched last week, Sergei Ivanov, head of Russia’s presidential administration, had clearly said Russia intended to use only its air force, which was acting at al-Assad’s request. Nikita Mendkovich, an analyst with the Russian Council on International Affairs, said Russia was not considering the possibility of a ground operation in Syria at the moment, because it was not required at the moment. "Russia's goal is to reduce the threat of ISIS by supporting the war effort of the legitimate government of Syria. The experience of the first days of the operation showed that the use of the air forces led to significant tactical successes and allowed [government forces] to stabilize the front line after the summer crisis," said Mendkovich. About the CNN report, he said the movement of artillery equipment from Latakia "is likely to be weaponry supplied to the Syrian army as part of military contracts. This is Syrian artillery, not ours," he said in an interview. Leonid Isayev, an orientalist and professor at the Higher School of Economics in Moscow, told RIR that defeating ISIS without a ground operation is impossible. "Support from the air helps the government forces to hold the territory that they control anyway," he said. "The Syrian army has suffered large losses in previous years and does not have the strength to do much else. To get more, you need to send ground troops into Syria." However, according to Isayev, Russia does not have enough resources for a ground intervention. "Moreover, we may harm Assad, because the larger our presence in Syria, the stronger the reaction of the West, Saudi Arabia and Turkey," he added. The main point, Isayev said, was that the Kremlin did not want to repeat the mistakes of the Soviet Union. "It is expected that at some point Russia will curtail air operations and will not allow itself to be drawn deeper into the Syrian conflict," he said. Vasily Belozerov, co-chairman of the Association of Military Political Scientists, said in a conversation with RIR that the "degree of presence of our forces in Syrian airspace is such that it is causing serious damage to ISIS, and that's enough."